The interactions between clouds, aerosols and radiation are highlighted as the key climate uncertainties in the recent Intergovernmental Panel on Climate Change (IPCC) assessment report.Atmospheric aerosol perturbs Earth’s radiation balance through two mechanisms: aerosol-radiation interactions (ari) and aerosol-cloud interactions (aci). These two mechanisms and the sub-processes involved are summarised in the figure below. The ari stem from direct scattering and absorption of solar and terrestrial radiation by aerosols, changing the planetary albedo. The aci, also termed indirect effects, arise from aerosols acting as cloud condensation (CCN) in warm clouds. An increase in the number of CCN translates into larger concentrations of smaller cloud droplets, increasing cloud albedo (Twomey, 1974). Both aerosol-radiation and aerosol-cloud interactions trigger fast adjustments to the profiles of temperature, moisture, and cloud water content, which ultimately affect cloud formation and precipitation rates (e.g. Albrecht; Pincus and Baker; Johnson et al.). The quantification of interactions in the cloud-aerosol-radiation system remains elusive. The recent IPCC report stresses that aerosol climate impacts remain the largest uncertainty in driving climate change, with a global mean effective forcing of -0.5 ± 0.4 W m-2 for the aerosol-radiation-interaction and in the range 0 to -0.9 W m-2 for the aerosol-cloud-interaction, counteracting a significant (but poorly constrained) fraction of greenhouse gas-induced global warming which is estimated as +2.8 ± 0.3 W m-2. This uncertainty limits our ability to attribute climate change, to quantify climate sensitivity, and therefore to improve the accuracy of future climate change projections. Furthermore, owing to the localisation of aerosol close to their sources, regions with strong anthropogenic influences have aerosol radiative forcings that are an order of magnitude larger than their global mean values, precluding reliable regional climate projections. The African continent is the largest global source of BBA currently contributing around 25 Tg yr-1 or 50% of global emissions (van der Werf). 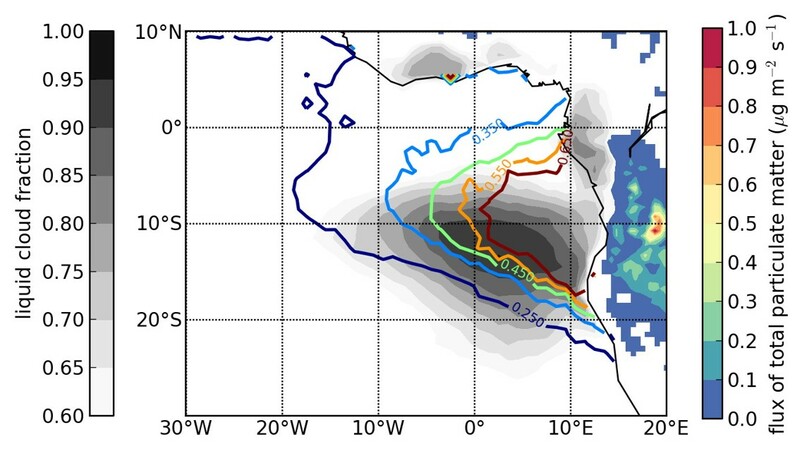 The meteorological transport of BBA over southern Africa during the dry season is dominated by an anticyclonic circulation, with westward transport on the northern periphery and eastward transport on the southern periphery (Garstang et al.). Over the continent, vertical mixing is inhibited by stable layers at the top of the continental boundary layer (around 3 km ASL) and by the main subsidence inversion (around 5 km ASL) (Garstang et al.). Over the SE Atlantic, the BBA in the residual continental boundary layer over-rides the marine boundary layer where low sea-surface temperatures give rise to persistent stratocumulus cloud – see figure right. A large temperature inversion (e.g. Haywood et al) may inhibit mixing between the BBA in the elevated residual continental boundary layer and the marine boundary layer which, in turn, may limit the interaction with the clouds. However, the degree of aerosol-cloud interaction is highly uncertain, highlighting the need for detailed measurements. Biomass burning smoke aerosol (BBA) consists of complex organic carbon compounds mixed with black carbon and inorganic species such as nitrate and sulphate. Black carbon is a strong absorber of sunlight (e.g. Shindell et al., Bond et al.) and certain organic compounds (so-called ‘brown carbon’) also absorb sunlight, particularly at shorter UV wavelengths (e.g. Andreae and Gelencsér). BBA is an important component of anthropogenic aerosol being produced from fires from deforestation, savannah burning, agricultural waste, and domestic biofuels with global emissions estimated to have increased by 25% since pre-industrial times (Lamarque et al.). BBA is estimated to exert a neutral global direct radiative forcing of -0.2 to +0.2 W m-2 (IPCC report). Even the sign of the global mean direct radiative forcing is in doubt because the single scattering albedo (SSA) of BBAs is close to the balance point between net reflection and net absorption of sunlight (e.g. Haywood and Shine). BBA plays a far more important role in regional climate: nowhere is the uncertainty in the direct radiative effect more apparent than over the SE Atlantic during the August-September dry season. The figure (left) shows the ‘direct’ radiative forcing in W m-2 derived from different models participating in AEROCOM (Myhre et al.) for the SE Atlantic, averaged over the August to September time period. The figure indicates a regional hotspot for BBA forcing over the SE Atlantic but with significant uncertainty because BBA can exist above the stratocumulus decreasing the planetary albedo. To accurately model the aerosol direct effect, models need to represent all of the following: the magnitude and geographic distribution of the aerosol optical depth (AOD), the wavelength dependent single scattering albedo, the BBA vertical profile, the geographic distribution of the cloud, the cloud fraction, the cloud liquid water content, the cloud droplet effective radii, and the cloud vertical profile (Keil and Haywood). Another implication of BBA overlying cloud is that satellite retrievals of cloud that rely on visible wavelengths are generally biased low in cloud optical depth and effective radius (e.g. Hsu et al., Haywood et al., Wilcox et al.) with implications for remotely sensed correlative studies of aerosol-cloud interactions (Quaas et al.). Recently de Graaf (2012) used high spectral resolution satellite data to show that the instantaneous direct radiative effect of BBA over clouds in the SE Atlantic region could be stronger than +130 Wm-2 instantaneously and +23 Wm-2 in the monthly mean. These values are far stronger than those diagnosed in climate models which reach only +50 Wm-2 instantaneously, suggesting that models misrepresent at least one key parameter noted above. A further aerosol-radiation interaction occurs as a fast adjustment to the direct effect and is called the semi-direct effect, where heating of the absorbing BBA layer and the reduction in surface temperature modify the atmospheric stability, clouds and hence radiative transfer. Satellite data over the Amazon has suggested a decrease in cloud fraction when BBA is situated above cloud (Koren et al.). Satellite observations over southern Atlantic stratocumulus have shown a thickening of cloud underlying BBA (Wilcox, Constantino and Breon). Wilcox estimated that this produced a negative radiative effect that compensated for 60% of the above cloud positive direct effect. 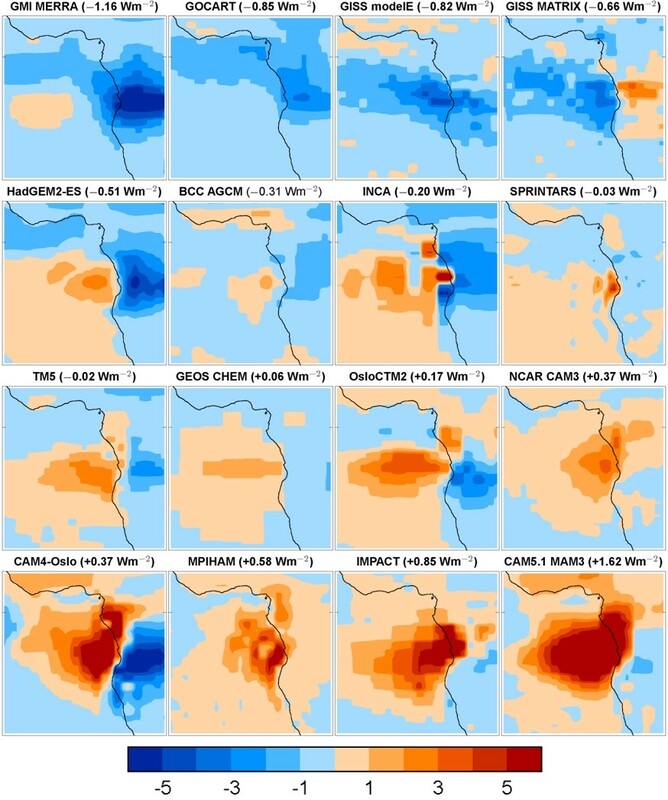 Model studies of the semi-direct effect take two main approaches: large eddy model (LEM) simulations and global modelling. Each approach has limitations that we will overcome in CLARIFY. LEMs have been used to explore the detailed mechanisms of the semi-direct effect (e.g. Johnson et al., Feingold et al., Hill and Dobbie), although they typically have relatively small domain sizes and therefore cannot account for the impact of aerosol in modifying synoptic scale circulations. Global modelling studies are able to represent impacts on synoptic and regional scale dynamics and circulation patterns (e.g. Allen and Sherwood, Randles and Ramaswamy) but are unable to represent the detailed process level mechanisms captured by LEMs. Studies in LEMs and global climate models have emphasised the importance of the vertical profile of aerosol and the degree of absorption (Johnson et al., Randles and Ramaswamy, Samset et al.). Randles and Ramaswamy and Allen and Sherwood document the response to the semi-direct effect via atmospheric impacts on stabilisation, reduced surface fluxes and subsequent evolution of the modelled dynamical impacts. Climate models need to parameterise many of the mechanisms by which the semi-direct effect operates and the climate response is likely to be sensitive to the details of the parameterisation. Johnson et al. found the semi-direct effect to be 5 times smaller in global scale models compared to LEMs although these results are challenged by Allen and Sherwood. In addition, internal variability masks local semi-direct effects, severely decreasing the statistical significance in previous studies of modelled semi-direct effects (e.g. Ghan et al., 2012) and our ability to assess their fidelity. Aerosol-cloud interactions, or ‘indirect effects’, remain one of the most elusive but key parameters in climate prediction (Stevens and Feingold). For stratocumulus, the effect of increased CCN leading to cloud brightening can be modulated by changes in precipitation and subsequent changes to cloud water amounts through entrainment processes (e.g. Ackerman et al.. Satellite studies of aerosol-cloud interactions in the region emphasise the critical role of the vertical profile of aerosol and cloud (Constantino and Breon). While global bulk aerosol models and empirical representations of aerosol indirect effects are being replaced with new microphysical aerosol models such as GLOMAP/UKCA-mode (e.g. Mann et al., Bellouin et al.) and more explicit representation of cloud and precipitation processes (Wilson et al. ), such schemes require extensive evaluation. The spatial resolution of global models (~100 km) is widely recognised as inadequate for investigating essential aerosol-cloud interaction processes at the cloud scale (~10’s m). Thus relationships between sub-grid-scale variables such as cloud updraft velocity and entrainment from LEMs and their link to large scale boundary layer variables are being sought. While promising work towards establishing these relationships has been performed, they are far from well established (e.g. Golaz et al.). Simulations with HadGEM2-CLASSIC suggest that, while BBA interaction with cloud may be limited by vertical stratification, it does enter the marine boundary layer and interact with cloud producing a strong indirect effect in the region. An assessment of parametric uncertainty in the GLOMAP global model driven by ECMWF meteorology and observed low-level clouds (Lee et al.) showed that BBA particles are one of the largest sources of uncertainty in CCN at cloud base. However, the contribution of BBA to uncertainty in indirect forcing was small (Carslaw et al., (2013), Faraday Discuss.) because strong particle sources essentially saturated cloud drop concentrations in the affected clouds. However, Lee et al. and Carslaw et al. did not assess the effect of uncertainties in the physical model, which control the extent to which BBA and clouds mix. There are important open questions about such global model assessments of BBA indirect effects that cannot be resolved without additional measurements. For example, the susceptibility of the clouds in background conditions; aerosol activation processes; uncertainty about where and when BBA aerosol is entrained into the marine boundary layer (MBL) and the impact of such entrainment on the microphysical and radiative properties of the cloud.